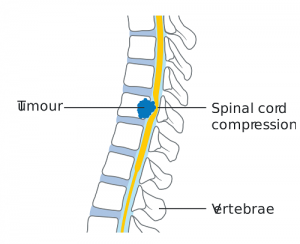 Nerve compression or spinal cord compression is something that occurs when any disorder or spinal condition puts pressure on the spinal cord. Usually, nerve compression is a phenomenon that can take place in almost any part of your spine i.e. from your neck to the lowest part of your spine. Apart from back pain, spinal cord compression can also cause pain, numbness and weakness specifically in the lower back and leg. Sciatica nerve compression can lead to pain in the leg and buttock area. Sciatica pain occurs in only one leg and hardly if ever trickle to both the legs. Before deciding upon a treatment option, back doctors usually perform a physical examination to understand the signs and symptoms of the patient. They may also order different diagnostic tests like X-ray, MRI scan and CT scan to get to the root of the problem. The usual treatment of spinal nerve compression includes medications, physical therapy, surgery and injections. Back surgery is only considered as an option when the nerve compression leads to serious problem like cauda equine syndrome. Let us take a brief look at the treatments. Physical therapy – Includes back strengthening exercises as well as back support equipment like braces and cervical collar.